Before the 2004 hunts, wildlife biologist and colleague Neal Eichholz and I spent a few days at Gallon Jug, Belize to test new callers on ocellated turkeys. 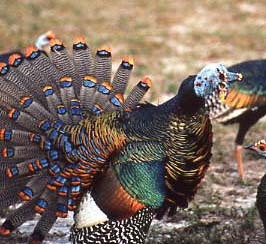 A ranch there has a large unhunted ocellated turkey population and is an ideal place to work. 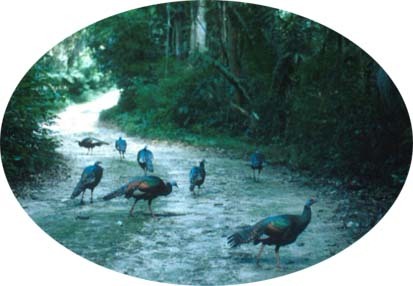 We had visited the ranch in November 2001 to record ocellated turkey calls. In 2 days of testing, we successfully called in more than 25 turkeys. One adult male came more than 500 yards across a cattle pasture in mid-day to within 25 yards of our position in less than 10 minutes and would have come closer but for a woven wire fence in his way. Needless to say, we were pleased with the results and anxious to get to the hunts to use the callers. A few days later the calling devices proved themselves in the hunts in Guatemala. Of the 22 turkeys taken on the 2004 hunts, 11 were called using either the new hand-held electronic device or the Doug Camp "turkey clucker." The clucker had been used successfully in 2003 but the electronic device was new. On the second hunt in 2004, all 5 hunters used a caller and were back in camp by 7:30 a.m. with their turkeys. In 4 other cases, hunters called turkeys in close but were unable to shoot because of dense vegetation. Two hunters called in turkeys and missed. In short, the new caller worked on nearly all the turkeys it was tried on. 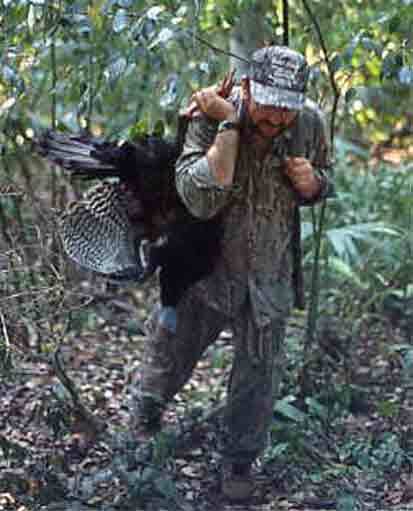 In 2005 the calling method continued to work well and to please the hunters. Of the 36 turkeys taken, 21 were called in. A few hunters opted to take a bird on the roost. The hand-held electronic caller was developed for us by Cass Creek International. Mike Battey prepared some of our recordings that went on the caller. Cass Creek International (www.casscreek.com) makes callers for predator hunting and various game species including elk, waterfowl, deer, and the North American wild turkey. Hunting turkeys with recorded calls is not legal in most U. S. states but the devices are ideal, and legal, for practicing the calls used in turkey hunting. Electronic calls are legal for hunting in Guatemala. 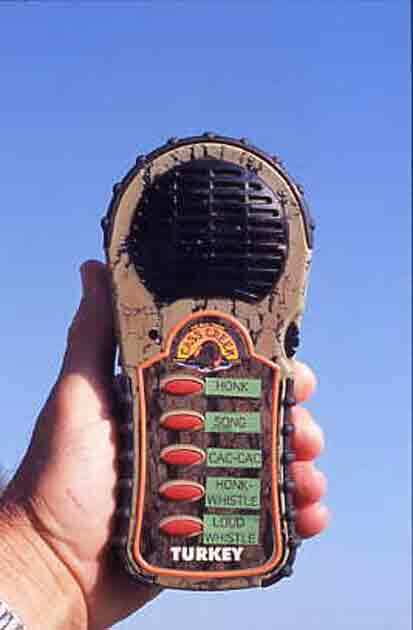 A Cass Creek calling device modified especially for calling ocellated turkeys and used in the Guatemala hunts. 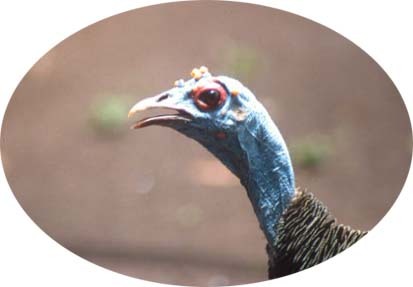 A Cass Creek calling device modified especially for calling ocellated turkeys. I do not plan to sell the electronic ocellated turkey calling devices or to release the recordings for general use. The recordings are "intellectual property" protected by law from duplication without express written permission from Lovett Williams. 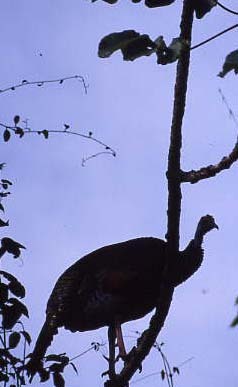 The electronic callers revealed which calls will be most useful in calling in ocellated turkey. We will be working to develop manually operated callers to imitate some of those same sounds. When developed, we will offer the manual callers for purchase by hunters. Until then, we will have a caller for each hunter and continue to use the highly effective electronic callers in our ocellated turkey hunts in Guatemala. Listen to drum tones followed by the song. Listen to a loud example of the song without drum tones.